THINGS TO DO IN BILBAO, SAN SEBASTIAN, VITORIA-GASTEIZ, BAYONNE, BIARRITZ, RIOJA OR PAMPLONA. Our selection of best art, sport, traditional & cultural events in the Basque Country during May, 2019. In Bayonne. 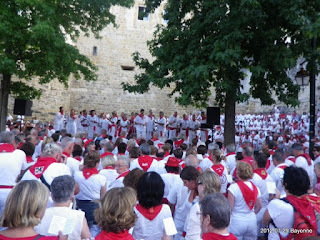 Traditional Basque chants. May 25th. In Vitoria-Gasteiz. Feast of San Prudencio and Our Lady of Estíbaliz. From April 27th until May 1st. In Bayonne. Art Crafts Festival. Cloister of the cathedral. From April 29th until May 4th. In Trucios. Exhibition of cattle breeds of Trucios-Turtzioz: bovine, equine, ovine, poultry and the V monochrome contest of the villainous dog. Stalls of talo, Spanish sausage, bread ... May 1st. In Gernika, Biscay. Anchovie day. Spring is the time for anchovies and being Gernika a big Basque fishermen port, this is one of the best moments to visit this village and taste anchovies with a local txakoli of Biscay. On May 3th. In Idiazabal, Gipuzkoa. Basque Cheese Fair. Contest and fair of Basque sheep cheeses in the city which gives the name to the Denomination of Origin of this Basque delicacy. During the morning you can see a shepherd leading the sheep. On May 4th and 5th. In Navaridas. VII Historical Wine Fair. Fair designed to learn about the history of wine in the world and highlight the importance of Rioja Alavesa wine. Paired tastings and local products. May 5th. In Berango. Agricultural and craft fair, and XXI Basque Country Championship of Basque Pastry. Fair of agricultural products and artisans; wood, pottery, fossils and minerals, jewelery ... there will also be stalls of talo, cheeses, honey, preserves, chocolate, txakoli ... etc. May 5th. In Orduña. Festivities Otxomaio. It recalls the appearance of the Virgin of La Antigua, patron of the city. May 8th. In Tolosa. Haragi: International meeting of the meat and the grill. From May 9th until 12th. In La puebla de Labarca. Wine Flag of Lapuebla de Labarca. Stands of local wineries. Lunches and music throughout the day. 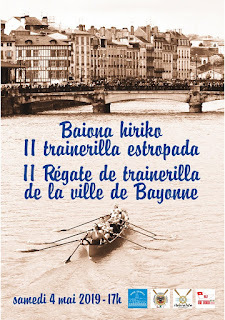 Bateles, rowing clubs of the Basque Country on the Ebro River. May 11th. In Bayonne. Pintxo Day. May 11th. In Laguardia. Bagpipers Day. The bagpipers from Alava and Spain. Concerts, dance festivals, composition competitions and restoration works, dances, parades ... May 11th and 12th. In Kuartango. XVII edition of the fair of the perretxiko and cattle of terreña race. Sale of perretxikos in the area. Exhibition and sale of artisan products. Monographic and exhibition of cattle of terreña race. Gastronomic tasting of terreña cow. May 12th. In Kuartango. Mushroom and cattle day. Cattle exhibit and local mushrooms in this lively fair. May 12th. In Ataun. Festival of San Isidro. Day of the Baserritarra (farmer). Vegetable competition. Elaboration and tasting of cheeses and cider tasting. May 15th. In San Francisco Javier Castell. "Javieradas". They are the popular, festive, penance or missionary pilgrimages to San Javier, Patron of the Missions and of Navarre. May 17th and May 25th. In Bermeo, Biscay. Arrain Azoka. Fish market in one of the biggest ports of the North of Spain. A good opportunity to try also fishes and preparations not so common in the Basque Country. Lamera Park. From May 17th until 19th. In Ondarroa. Antxoa Egune (Anchovy Day). A full day dedicated its most iconic fish. The central day of the party is Saturday 18th, but during the week various events are also organized. In Antoñana. Spring fair of honey. Competition, tasting, sale of honey and artisan products. Exhibition of crafts. May 19th. In Bayonne. Traditional Basque chants. Lacarre Place May 25th. their vision of the fusion between art, science and technology. In Bayonne. Expo Jean-Paul Tillac. Has lived three wars, the two world wars on French soil, and the civil war of Spain whose repercussions were strong in the Basque Country of France. Basque Museum. From December 18th, 2018 until May 26th, 2019. In Getaria. Cristobal Balenciaga: Fashion and Heritage. Contexts Fashion and Heritage maintain a paradoxical dialogue that contrasts the ephemeral and the permanent. A conversation that, nevertheless, converges in the designer. Cristóbal Balenciaga Museum. From March 1st, 2019 to January 20th, 2020. In Bilbao. Never real and always true. Exhibition on the symbiosis between art and literature. A motto that connects the thirteen participating artists, who move between both worlds and whose works deal naturally with art as a literary genre and literature as an exhibition project. Azkuna Center. From March 14th until September 22nd. In Bilbao. “Jenny Holzer: The Indescriptible”. Its medium, whether it is translated into T-shirts, plaques or electronic signals, is the text. Bilbao Guggenheim Museum. From March 22nd, 2019 until September 28th. In Bilbao. MAZ Basauri Festival. It includes concerts, a series of music-related films and performances for the whole family as part of Txiki (kids) MAZ. The festival offers a comprehensive programme in different musical styles. From April 26th until May 4th. In San Sebastian. GDM (Fashion Gipuzkoa) San Sebastian Fashion Festival. From April 29th until May 10th. In San Sebastian. V World Forum of Gastronomic Tourism 2019. Kursaal. Palace of Congresses / Auditorium. May 2nd and 3rd. In San Sebastian. Tango Festival. With demonstrations and free courses. Victoria Eugenia Theater. From May 2nd until 5th. In Bilbao. FANT. Fantastic Film Festival of Bilbao. From May 2nd until 11th. In Bilbao. Bilbao Art District ‘Arts Week’ will fill the streets and different spaces in the city linked to creativity and the exhibition of art with artistic proposals. From May 2nd until 12th. In Bilbao. Symphony Orchestra of Bilbao. Euskalduna Auditorium. May 2nd, 3rd, 16th and 19th. In Vitoria-Gasteiz. Mandalain Ballet Biarritz offers three works: Rêverie Romantique, Death of the Swan and Bolero de Ravel. Main Theater Antzokia. May 3rd. In Bilbao. Ennio Morricone announces a second concert in Spain on his final farewell tour of the stage. He will personally conduct an orchestra and chorus of 200 people and will feature the Portuguese Dulce Pontes as a guest artist. May 4th. In San Sebastian. Great night of opera and zarzuela - Orfeón Donostiarra and Santa Cecilia classical orchestra. Kursaal Auditorium. May 4th. In San Sebastian. Ruper Ordorika concert. Basque music. Kursaal Auditorium. May 5th. In Bilbao. Chamber Concert of the Bilbao Symphony Orchestra. Euskalduna Auditorium. May 6th. In San Sebastian. Basque Country Symphony Orchestra. Kursaal Auditorium May 6th, 10th, 24th and 27th. In Bilbao. Basque Country Symphony Orchestra. Euskalduna Auditorium. May 8th and 23rd. In Bilbao. Cuba National Symphony Orchestra and Silvio Rodríguez. Euskalduna Auditorium. May 9th. In San Sebastian. EuroGap Forum. Business Marketing. Kursaal Palace of Congresses / Auditorium. May 9th. In Bilbao. IX Fair of Used Vehicles. Bilbao Exhibition Center. From May 9th until 12th. In Bilbao. “Expovacaciones”. International Tourism Contest. Guest country: Japan. Bilbao Exhibition Centre. From May 10th until 12th. In Irún. Caravantur 2019. Exhibition, sale and rental of Caravans, Motorhomes, Campers, Vans and Caravaning accessories. FICOBA. From May 10th until 12th. In Saint Jean de Luz. Concert with Kanta Donibane. Kiosk. Place Louis XIV. May 12th. In Bilbao. Technarte. Artists and technologists from all over the world share their vision of the fusion between art, science and technology. Euskalduna Palace. May 16th and 17th. In Errenteria. Musikaste: Musical Week. Festivity that has been celebrated since 1974, with the purpose of promoting and promoting the autochthonous musical culture. From May 17th until 25th. In Vitoria-Gasteiz. International Festival "Poets in May". There are local and foreign poets, associations, workshops, musical groups, actresses and actors, singers and artists of music and dance. May ¿?th. In San Sebastian. The Adams Family. Musical comedy produced by LetsGo Company. Kursaal Auditorium. From May 17th until 19th. In Bilbao. Opera: Les Pêcheurs de Perles (George Bizet). Euskalduna Auditorium. May 18th, 21st, 24th and 27th. In Biarritz. Ballet Theater Basel. Energy and high intensity, powerful and rhythmic dance. Gare Du Midi Theater. May 21st. In VItoria-Gasteiz. Ivo Pogorelich. Piano recital. Mozart, Liszt and Schumann. Antzokia Theater. May 23th. In Bilbao. Ballet Theater Basel. Energy and high intensity, powerful and rhythmic dance. Arriaga Theater. May 24th and 25th. In Bilbao. Gerhard Richter: Marinas. With these paintings and drawings, Richter confronts us with the problem of representation, since the painted surface and the photographic record merge. Bilbao Guggenhein Museum. From May 24th until September 9th. In San Sebastian. "Aquatic Music" by Handel, for the Akademie für Alte Musik in Berlin. Kursaal Auditorium May 25th. In Biarritz. Triana La Flamenquita Dance School. Le Colisée. May 25th. In San Sebastian. “Cinderella" by the National Ballet of Cuba. Kursaal Auditorium. May 26th. In Bilbao. XVI International Festival of emergent scene. Experiences of arts visas in short format of no more than 30 minutes with only 3 or 4 pieces, dance, circus, theater.... From May 29th until June 1st. In Irún. Basquisite. Exquisite Foods and Beverages Show. FICOBA May 30th and 31th. In Bilbao. New Book Fair. Arenal. From May 30th until June 9th. In Bayonne. Selenite. With 150 concerts in Europe, Selenite has been able to borrow the sensitivity of the blues and the candor of minimalist folk to offer an intimate and visceral rock. May 31st. In Vitoria-Gasteiz. “Cinderella " by the National Ballet of Cuba. Main Theater. May 31st. In Saint Jean de Luz. Dance gala. Show. Jai Alai. May 31st. In San Sebastian. Ola tu !!! Talk a !!! Cultural festival. Multidisciplinary festival of theater, music, dance ... designed by the own citizenship that establishes ways of collaboration between professional and amateur artists. From May 31th until June 2nd. In Bayonne. 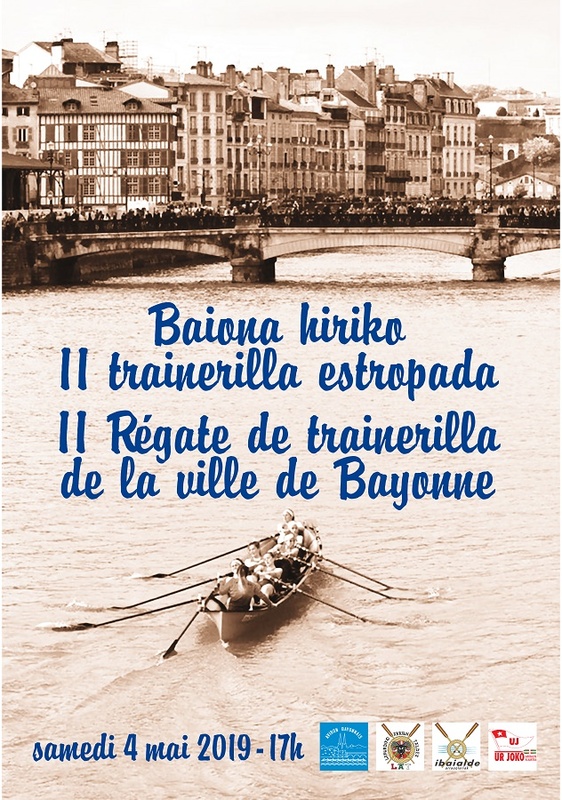 Regatta of Trainérillas. In Saint Jean de Luz. Child football tournament of the 7 Basque provinces. Kechiloa Stadium. May 1st. In Eskoriatza. Puntaik Punta. Debagoiena hiking festival. From May 1st until 5th. In Bilbao. 7th edition of Menditrail. It's a middle distance mountain race. This year, in addition to its two trails (30 km and 22 km) and the 22km mountain walk, it will add a new 11km family walk. May 5th. In Saint Jean de Luz. Golf Tournament: Prix Maison Deutz. Chantaco Golf. May 5th. In Bayonne. Regatta of Trainérillas. It is organized on the Nive river. May 4th. In Saint Jean de Luz. Tournoi de golf: Prix Domaine de Chevalier. Golf Tournament: Domaine de Chevalier Award. Chantaco Golf. May 11th. In Biarritz. Basque Ball to Short Shovel. Berri Square. May 8th, 15th, 22nd and 29th. In Zarautz. Pro Zarautz 2019 -World Surf Championship. This year the circuit of world character with QS1500. Parallel activities: film screenings, concerts by various groups, exhibitions, volleyball and beach soccer games or a skate exhibition. From May 8th until 12th. In Saint Jean de Luz. Golf Tournament: Prix de la Cave du Pichet. Chantaco Golf. May 19th. In Saint Jean de Luz. Air meeting of the patrol of France. Bay of Saint Jean de Luz. May 19th. In Bayonne. Pelotaris tournament. Basque hand ball tournament with the participation of the best Elite Pro teams. Haitz Pean ratchet. May 24th and 29th. In Saint Jean de Luz. Tournoi de golf: Médaille Mensuelle. Chantaco Golf. May 25th. And remember, if you are thinking to come to Bilbao, San Sebastian, Rioja, Vitoria, Pamplona or anywhere else in the Basque Country, you can get a better understanding on our culture and traditions with a local guide.